Racing the clock can be exhilarating while you're at it, but I'd much rather take my time and enjoy the scenery as I stroll through life. The pace of life can go so fast that we often lose track of what is around us as we go forward. We spend our lives stuck between yesterday and today, never completely sure of what lies ahead and often oblivious of the things we missed along the way. The racer will focus on the prize that awaits at the finish line while often missing out on those gems that are passed by along the way to that final destination. Clocks might stop, but time races on as we are swept forward. In the race of life, the winner is not the one who reaches the end first with the fastest speed. Speaking of races, my last Battle featuring the song "In Between Days" originally done by the Cure was a horse race from the starting gate. Then in the final stretch, the Ben Folds version took the lead to leave Cementerio Club in the dust. My vote could go for either of these fine performances, but I'll cast mine along with the winning team. The frantic pace of the Ben Folds version seems more appropriate for the racing theme I've presented in this post though a good case can be made that the version Cementario Club captures the spirit of the lyrics in a more appropriate way. So it's Ben Folds for me in this Battle. 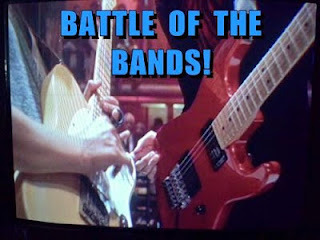 Next Battle of the Bands on Monday May 1st! We're in the final stretch of the 2017 Blogging from A to Z April Challenge so just a few more posts until I wrap up my series on the It's About Time theme. I hope you stay with me until the end. Then I definitely hope you'll join me for my next Battle of the Bands post when I'll have a song chosen especially in honor of the occasion of the end of another Challenge. Is your life more of a rat race or a pleasant stroll though the park? How do you slow down to enjoy life better? Do you enjoy it when you are faced with deadlines and a pressure to get things done? Yes Lee one is always in a hurry to get things done that we don't take stock of the present moment. Yvonne, sometimes it seems we have no choice but to rush through our life chores, but still we can appreciate the details as we go and dream if it doesn't distract us too much. My life is not a rat race it is rather slow. I would like some excitement yet not rat race... It is too monotonous and may get dull. Excitement enough to keep my mind away from darkness of depression slow enough for I want to enjoy the journey. Karnika, our perspective is likely more responsible for the sense of monotony in life and not the actual acts in which we are engaged. The "whooshing noise" is pretty cool, but I don't like losing sight of where I've been to get to where I am. Yep, we're heading toward the finish line as the A2Z race will soon end and you can count on me to continue rallying by your side. Thank you for leaving all many rahs in comments and repeated visits to Curious as a Cathy. I'm certain we'll be a bit ragged and a rest from blogging will be in order when this is all over. Thank you for hosting the fun and for reporting your BoTB results. Looks like I didn't win this time. :( Happy a2zing, my friend! Cathy, ragged and weary gets a boost with a new set of clothes and a refreshed outlook on life. I'll be ready to move on with something new after April ends. Rat race it can be when you need $$$$. But staying ahead works for me. Deadlines and pressure are nothing to me. Pat, deadlines and pressure sharpens our wits and strengthens our resolve. Giving up is our biggest enemy in life. Stacey, please hang in there. It's not time for you to leave us any time soon. I don't do deadlines any more. I don't bow to pressure. For me life is a stroll along the beach. Every day. And....breathe! Another day in Amble Bay! Keith, I think some good stress can keep us in a toned mental and physical shape, but nothing like a nice long peaceful stroll on the beach. I'll admit I get a lot more done under the pressure of deadlines but I can't say I enjoy it. I'm a casual stroller by nature. LD, casual strolling feels better while we're at it, but it can be a pretty good feeling to successfully complete a difficult task. Life is a rat race. I can't stand it. Even if I'm home doing crafts, times races by. I seem to be more busy now that I don't work full time than when I did. I miss the slow pace of the 70s. Or at least pre-technology. JoJo, really I don't like to be in any race. I'd rather take my good old time. The 70s did seem to have a slower pace, but I was in my twenties and in less of a hurry. I think I chose the loser in this battle. Can't win 'em all. 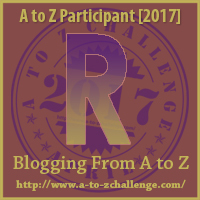 Right now, I'm racing against time trying to get the last few A to Z posts completed and catch up with visits and comment responses. Think I'm losing that battle too! I'm glad we're closing in on the finish line. Thanks for starting this challenge and keeping it going, as well your support of my posts. Have a good weekend! Debbie, no losers here! I can't say I'm racing that much, but I'm doing posts on a day to day basis. Maybe I'll get ahead of myself this weekend. Thanks for being a part of another great challenge. The 24x7x365 life in the Silicon Valley was the primary reason for our move to Ecuador. My husband and I grew tired of living for work instead of living for ourselves. Time still flies by but we are in control of what happens in that time now. Emily, living to work is not the way things should be done. Can't blame you too much for choosing the move you made. My life is not a rat race but it is also not a stroll in the park either. I do enjoy time to take in the fresh air and smell the roses kind of thing. However, I still have to work to keep going too. That at times can be kinda sucky. Naila, a happy medium is a good approach to life. Tip the scales too much and you're apt to fall off. I am not into the rat race at all...but I did like the movie and even the one for the letter S with Alan Alda...hahahaa. Ok, I love the European style where they seem to enjoy life much more than in Canada or the States. They have their main meal at lunch time, many walk or ride bikes and they just have a better philosophy..to me anyway. Birgit, that's an image we see, but never having been in Europe I wouldn't know firsthand. I do like to take my time and relax though. Sorry I'm so late getting over here! Not a bad Battle, LEE. You know my BOTB philosophy: Any Battle that ends within a 5-vote margin of victory was a success. To me, anyway, once it gets to a 6-vote win or more, it's a bit of a blowout and can't be said to have been too terribly interesting. Seems there were mostly pretty tight Battles this time around. See ya on May 1st for the next round. STMcC, Always nice to keep things a bit interesting if not difficult to predict. There are times when I'd like to have gone through life a little slower and with more of an eye toward enjoying it. John, or at least paid closer attention to the details of what was going on while life was happening.